The apparent weight of an object increases in an elevator while accelerating upward. A person sells peanuts using a beam balance in an elevator. Will he gain more if the elevator is accelerating up? No, the accelerating elevator will affect the weight of both sides of the beam balance. So, the net effect of the accelerating elevator cancels out, and we get the actual mass. A boy puts a heavy box of mass M on his head and jumps from the top of a multi-storied building to the ground. What is the force exerted by the box on the boy’s head during his free fall? Does the force greatly increase during the period he balances himself after striking the ground? Yes, the force greatly increases during the period he balances himself after striking the ground because of the weight of the box. A person drops a coin. Describe the path of the coin as seen by the person if he is in (a) a car moving at constant velocity and (b) in a free falling elevator. (a) In the car, the path of the coin will be vertically downward because the only force acting on the coin is gravity in the downward direction. (b) In a free falling elevator, the coin as well as the person will be in a condition of weightlessness. So, the coin will remain stationary w.r.t. the person. Is it possible for a particle to describe a curved path if no force acts on it? Does your answer depend on the frame of reference chosen to view the particle? If no force acts on the particle it cannot change its direction. So, it is not possible for a particle to describe a curved path if no force acts on it. Yes, the answer depends on the frame of reference chosen to view the particle if the frame of reference describes a curved path. You are travelling in a car. The driver suddenly applies the brakes and you are pushed forward. Why does this happen? We are pushed forward because of the inertia of motion, as our body opposes the sudden change. It is sometimes heard that the inertial frame of reference is only an ideal concept and no such inertial frame actually exists. Comment. We can’t find a body whose acceleration is zero with respect to all other bodies in the universe because every body in the universe is moving with respect to other bodies.As we live on earth which itself is accelerates due to its revolution around the sun and spinning about its own axis, so whatever observations and measurements ,we make , are w.r.t to earth which itself is not an inertial frame.Similarly all other planets are also in motion around the sun so tdeally no inertial frame is possible. An object is placed far away from all the objects that can exert force on it. A frame of reference is constructed by taking the origin and axes fixed in this object. Will the frame be necessarily inertial? Yes, if the force on the object is zero, its acceleration w.r.t. all the other objects will we zero. So, the frame will necessarily be an inertial frame. The figure shows a light spring balance connected to two blocks of mass 20 kg each. The graduations in the balance measure the tension in the spring. (a) What is the reading of the balance? (b) Will the reading change if the balance is heavy, say 2.0 kg? (c) What will happen if the spring is light but the blocks have unequal masses? (b) If the balance is heavy, the reading will not change because the weight of spring balance does not affect the tension in the string. (c) If the blocks have unequal masses, the spring balance will accelerate towards the heavy block with an acceleration a. Then the reading will be equal to the tension in the string. The acceleration of a particle is zero, as measured from an inertial frame of reference. Can we conclude that no force acts on the particle? No. The acceleration of the particle can also be zero if the vector sum of all the forces is zero, i.e. no net force acts on the particle. Suppose you are running fast in a field and suddenly find a snake in front of you. You stop quickly. Which force is responsible for your deceleration? The force of friction acting between my feet and ground is responsible for my deceleration. If you jump barefoot on a hard surface, your legs are injured. But they are not injured if you jump on a soft surface like sand or pillow. Why? F=dPdt, force in the first case will be more. That’s why we are injured when we jump barefoot on a hard surface. According to Newton’s third law, each team pulls the opposite team with equal force in a tug of war. Then, why does one team win and the other lose? The forces on the rope must be equal and opposite, according to Newton’s third law. But not all the forces acting on each team are equal. The friction between one team and the ground does not depend on the other team and can be larger on one side than on the other. In addition, the grips on the rope need not be equal and opposite. Thus, the net force acting on each team from all sources need not be equal. A spy jumps from an airplane with his parachute. The spy accelerates downward for some time when the parachute opens. The acceleration is suddenly checked and the spy slowly falls to the ground. Explain the action of the parachute in checking the acceleration. Air applies a velocity-dependent force on the parachute in upward direction when the parachute opens. This force opposes the gravitational force acting on the spy. Hence, the net force in the downward direction decreases and the spy decelerates. Consider a book lying on a table. The weight of the book and the normal force by the table on the book are equal in magnitude and opposite in direction. Is this an example of Newton’s third law? Yes, this is an example of Newton’s third law of motion, which sates that every action has an equal and opposite reaction. Two blocks of unequal masses are tied by a spring. The blocks are pulled stretching the spring slightly and the system is released on a frictionless horizontal platform. Are the forces due to the spring on the two blocks equal and opposite? If yes, is it an example of Newton’s third law? Yes, the forces due to the spring on the two blocks are equal and opposite. But it’s not an example of Newton’s third law because there are three objects (2 blocks + 1 spring). Spring force on one block and force by the same block on the spring is an action-reaction pair. When a train starts, the head of a standing passenger seems to be pushed backward. Analyse the situation from the ground frame. Does it really go backward? Coming back to the train frame, how do you explain the backward movement of the head on the basis of Newton’s laws? No, w.r.t. the ground frame, the person’s head is not really pushed backward. As the train moves, the lower portion of the passenger’s body starts moving with the train, but the upper portion tries to be in rest according to Newton’s first law and hence, the passenger seems to be pushed backward. A plumb bob is hung from the ceiling of a train compartment. If the train moves with an acceleration ‘a‘ along a straight horizontal track , the string supporting the bob makes an angle tan−1 (a/g) with the normal to the ceiling. Suppose the train moves on an inclined straight track with uniform velocity. If the angle of incline is tan−1 (a/g), the string again makes the same angle with the normal to the ceiling. Can a person sitting inside the compartment tell by looking at the plumb line whether the train is accelerating on a horizontal straight track or moving on an incline? If yes, how? If not, then suggest a method to do so. No, a person sitting inside the compartment can’t tell just by looking at the plumb line whether the train is accelerating on a horizontal straight track or moving on an incline. 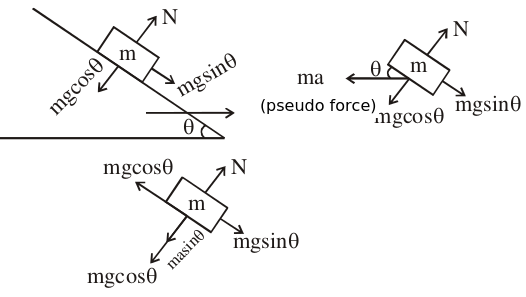 mg2+a2; when it is moving on the inclined plane, the tension is mg. So, by measuring the tension in the string we can differentiate between the two cases. The ceiling pulls the chain by a force (w1 + w2). The horse pushes the ground in the backward direction and, in turn, the ground pushes the horse in the forward direction, according to Newton’s third law of motion. The car pushes the ground in the backward direction and according to the third law of motion, reaction force of the ground in the forward direction acts on the car. A block of mass 10 kg is suspended from two light spring balances, as shown in the figure. (a) Both the scales will read 10 kg. (b) Both the scales will read 5 kg. (c) The upper scale will read 10 kg and the lower zero. (d) The readings may be anything but their sums will be 10 kg. Therefore, both the spring balances will read the same mass, i.e. 10 kg. Normal force exerted by the plane on the block is mg cosθ. If the earth suddenly stops attracting objects placed near its surface, the net force on the person will become zero and according to the first law of motion, the person will remain standing. As the whole system is at rest, the resultant force on the charged particle at A is zero. A force F1 acts on a particle accelerating it from rest to a velocity v. Force F1 is then replaced by F2 which decelerates the particle to rest. (a) F1 must be equal to F2. (b) F1 may be equal to F2. (c) F1 must be unequal to F2. Any force applied in the direction opposite the motion of the particle decelerates it to rest. Two objects A and B are thrown upward simultaneously with the same speed. The mass of A is greater than that of B. Suppose the air exerts a constant and equal force of resistance on the two bodies. (a) The two bodies will reach the same height. (b) A will go higher than B. (c) B will go higher than A. (d) Any of the above three may happen depending on the speed with which the objects are thrown. Let the air exert a constant resistance force = F (in downward direction). 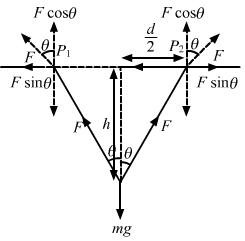 Acceleration of particle A in downward direction due to air resistance, aA = F/mA. Acceleration of particle B in downward direction due to air resistance, aB = F/mB. HA>HBTherefore, A will go higher than B. Downward gravitational force will be balanced by the upward pseudo force (because of the motion of the wedge in downward direction). The block will remain at its position, as both the box and the inclined plane are falling with the same acceleration (g). Let acceleration due to air resistance force be a. Let H be maximum height attained by the particle. Direction of air resistance force is in the direction of motion. t2=2Hg+a …(2)So, t1 > t2. (d) t1 < t2 or t1 > t2 depending on whether the lift is going up or down. After the coin is dropped, the only force acting on it is gravity, which is same for both the cases. The moving train does not put any extra force on the alpha particle and the recoiling nucleus. So, the distance between the alpha particle and the recoiling nucleus at a time t after the decay, as measured by the passenger, will be same as before, i.e. x. A reference frame attached to the earth cannot be an inertial frame because the earth is revolving around the sun and also rotating about its axis. dvdt = md(0)dt = m×0 = 0. Now, if the frame is inertial, then the resultant force on the particle is zero. vector sum of all the forces plus a pseudo force is zero. A particle is found to be at rest when seen from a frame S1 and moving with constant velocity when seen from another frame S2. Mark out the possible options. (a) Both the frames are inertial. (b) Both the frames are non-inertial. (c) S1 is inertial and S2 is non-inertial. S1 is moving with constant velocity w.r.t frame S2. So, if S1 is inertial, then S2 will be inertial and if S1 is non-inertial, then S2 will be non-inertial. Slope of the x-t graph gives velocity. In the regions AB and CD, slope or velocity is constant, i.e. acceleration is zero. Hence, from the second law, force is zero in these regions. The figure shows a heavy block kept on a frictionless surface and being pulled by two ropes of equal mass m. At t = 0, the force on the left rope is withdrawn but the force on the right end continues to act. Let F1 and F2 be the magnitudes of the forces exerted by right rope and the left rope on the block, respectively. At t < 0, the block is in equilibrium in the horizontal direction. At t > 0, F2 = 0 and F1 = F.
It means normal force exerted by the floor of the elevator on the person is greater that the weight of the person. That is, there’s no acceleration or uniform velocity. So, the elevator is going up/down with uniform speed. A particle is observed from two frames S1 and S2. Frame S2 moves with respect to S1 with an acceleration a. Let F1 and F2 be the pseudo forces on the particle when seen from S1 and S2, respectively. Which of the following is not possible? as2s1=0 …2From equations (1) and (2), we can say that our assumption is wrong. And F1 = 0, F2 = 0 is not possible. A person says that he measured the acceleration of a particle to be non-zero even though no force was acting on the particle. (a) He is a liar. (b) His clock might have run slow. (c) His metre scale might have been longer than the standard. (d) He might have used a non-inertial frame. If no force is acting on a particle and yet, its acceleration is non-zero, it means the observer is in a non-inertial frame. A block of mass 2 kg placed on a long frictionless horizontal table is pulled horizontally by a constant force F. It is found to move 10 m in the first seconds. Find the magnitude of F.
Let a be the acceleration of the block. A car moving at 40 km/hr is to be stopped by applying brakes in the next 4 m. If the car weighs 2000 kg, what average force must be applied to stop it? In a TV picture tube, electrons are ejected from the cathode with negligible speed and they attain a velocity of 5 × 106 m/s in travelling one centimetre. Assuming straight-line motion, find the constant force exerted on the electrons. The mass of an electron is 9.1 × 10−31 kg. Initial velocity of the electrons is negligible, i.e. u = 0. A block of mass 0.2 kg is suspended from the ceiling by a light string. A second block of mass 0.3 kg is suspended from the first block by another string. Find the tensions in the two strings. Take g = 10 m/s2. ∴ The tensions in the two strings are 5 N and 3 N, respectively. Two blocks of equal mass m are tied to each other through a light string. One of the blocks is pulled along the line joining them with a constant force F. Find the tension in the string joining the blocks. Let a be the common acceleration of the blocks. A particle of mass 50 g moves in a straight line. The variation of speed with time is shown in figure (5−E1). Find the force acting on the particle at t = 2, 4 and 6 seconds. Slope of the v-t graph gives acceleration. ⇒ F = 0.25 N along the motion. or, F = 0.25 N opposite the motion. Two blocks A and B of mass mA and mB , respectively, are kept in contact on a frictionless table. The experimenter pushes block A from behind, so that the blocks accelerate. If block A exerts force F on block B, what is the force exerted by the experimenter on block A? Let F’ = force exerted by the experimenter on block A and F be the force exerted by block A on block B. Let a be the acceleration produced in the system. Raindrops of radius 1 mm and mass 4 mg are falling with a speed of 30 m/s on the head of a bald person. The drops splash on the head and come to rest. Assuming equivalently that the drops cover a distance equal to their radii on the head, estimate the force exerted by each drop on the head. A particle of mass 0.3 kg is subjected to a force F = −kx with k = 15 N/m. What will be its initial acceleration if it is released from a point x = 20 cm? ⇒a=kxm=150.20.3=30.3=10 m/s2So, the initial acceleration when the particle is released from a point x = 20 cm is 10 m/s2. Both the springs shown in figure (5−E2) are unstretched. If the block is displaced by a distance x and released, what will be the initial acceleration? Let the block m be displaced towards left by displacement x.
k1+k2xmopposite the displacement or towards the mean position. A small block B is placed on another block A of mass 5 kg and length 20 cm. Initially, the block B is near the right end of block A (Figure 5−E3). A constant horizontal force of 10 N is applied to the block A. All the surfaces are assumed frictionless. Find the time that elapses before block B separates from A. ⇒a=105=2 m/s2As there is no friction between A and B, when block A moves, block B remains at rest in its position. A man has fallen into a ditch of width d and two of his friends are slowly pulling him out using a light rope and two fixed pulleys as shown in figure (5−E4). Show that the force (assumed equal for both the friends) exerted by each friend on the road increases as the man moves up. Find the force when the man is at a depth h.
(a) At any depth, let the ropes makes an angle θ with the vertical. ⇒F=mg2cosθAs the man moves up, θ increases, i.e. cosθ decreases. Thus, F increases. The elevator shown in figure (5−E5) is descending with an acceleration of 2 m/s2. The mass of the block A is 0.5 kg. What force is exerted by the block A on the block B? When the elevator is descending, a pseudo-force acts on it in the upward direction, as shown in the figure. N=mg-a⇒N=0.510-2=4 NSo, the force exerted by the block A on the block B is 4 N.
A pendulum bob of mass 50 g is suspended from the ceiling of an elevator. Find the tension in the string if the elevator (a) goes up with acceleration 1.2 m/s2, (b) goes up with deceleration 1.2 m/s2, (c) goes up with uniform velocity, (d) goes down with acceleration 1.2 m/s2, (e) goes down with deceleration 1.2 m/s2 and (f) goes down with uniform velocity. A person is standing on a weighing machine placed on the floor of an elevator. The elevator starts going up with some acceleration, moves with uniform velocity for a while and finally decelerates to stop. The maximum and the minimum weights recorded are 72 kg and 60 kg, respectively. Assuming that the magnitudes of acceleration and deceleration are the same, find (a) the true weight of the person and (b) the magnitude of the acceleration. Take g = 9.9 m/s2. Maximum weight will be recorded when the elevator accelerates upwards. Let N be the normal reaction on the person by the weighing machine. When decelerating upwards, minimum weight will be recorded. So, the true mass of the man is 66 kg. Find the reading of the spring balance shown in figure (5−E6). The elevator is going up with an acceleration g/10, the pulley and the string are light and the pulley is smooth. Let the left and right blocks be A and B, respectively. And let the acceleration of the 3 kg mass relative to the elevator be ‘a‘ in the downward direction. A block of 2 kg is suspended from a ceiling by a massless spring of spring constant k = 100 N/m. What is the elongation of the spring? If another 1 kg is added to the block, what would be the further elongation? Let elongation in the spring be x. Suppose the ceiling in the previous problem is that of an elevator which is going up with an acceleration of 2.0 m/s2. Find the elongation. When the ceiling of the elevator is going up with an acceleration ‘a’, then a pseudo-force acts on the block in the downward direction. = 0.36 − 0.24 = 0.12 m.
The force of buoyancy exerted by the atmosphere on a balloon is B in the upward direction and remains constant. The force of air resistance on the balloon acts opposite the direction of velocity and is proportional to it. The balloon carries a mass M and is found to fall to the earth’s surface with a constant velocity v. How much mass should be removed from the balloon so that it may rise with a constant velocity v? Let M be mass of the balloon. Let the air resistance force on balloon be F .
Given that F ∝ v.
where k = proportionality constant. ⇒M=B+kvgLet the mass of the balloon be M’ so that it can rise with a constant velocity v in the upward direction. ⇒M’=B+kvg∴ Amount of mass that should be removed = M − M’. An empty plastic box of mass m is found to accelerate up at the rate of g/6 when placed deep inside water. How much sand should be put inside the box so that it may accelerate down at the rate of g/6? Let U be the upward force of water acting on the plastic box. Let m be the initial mass of the plastic box. ⇒m=6U7g ….iLet M be the final mass of the box after putting some sand in it. A→is a constant vector in the horizontal direction. With what minimum speed, a particle of mass m be projected so that it continues to move without being defelected and with a constant velocity? For the particle to move without being deflected and with constant velocity, the net force on the particle should be zero. ∴v=mgAsinθv will be minimum when sinθ = 1. In a simple Atwood machine, two unequal masses m1 and m2 are connected by a string going over a clamped light smooth pulley. In a typical arrangement (figure 5−E7), m1 = 300 g and m2 = 600 g. The system is released from rest. (a) Find the distance travelled by the first block in the first two seconds; (b) find the tension in the string; (c) find the force exerted by the clamp on the pulley. Consider the Atwood machine of the previous problem. The larger mass is stopped for a moment, 2.0 s after the system is set into motion. Find the time that elapses before the string is tight again. At this time, m2 is moving 6.52 m/s downward. At time 2 s, m2 stops for a moment. But m1 is moving upward with velocity 6.52 m/s. It will continue to move till final velocity (at highest point) becomes zero. ⇒t=6.529.8≈23 secAfter this time, the mass m1 also starts moving downward. Figure (5−E8) shows a uniform rod of length 30 cm and mass 3.0 kg. The strings shown in the figure are pulled by constant forces of 20 N and 32 N. Find the force exerted by the 20 cm part of the rod on the 10 cm part. All the surfaces are smooth and the strings and the pulleys are light. Let F = contact force between them. Consider the situation shown in figure (5−E9). All the surfaces are frictionless and the string and the pulley are light. Find the magnitude of acceleration of the two blocks. A constant force F = m2g/2 is applied on the block of mass m1 as shown in figure (5−E10). The string and the pulley are light and the surface of the table is smooth. Find the acceleration of m1. In figure (5−E11), m1 = 5 kg, m2 = 2 kg and F = 1 N. Find the acceleration of either block. Describe the motion of m1 if the string breaks but F continues to act. Let the acceleration of the blocks be a. ⇒a=3g7=29.47 =4.2 m/s2Hence, acceleration of the block is 4.2 m/s2. Let m1 = 1 kg, m2 = 2 kg and m3 = 3 kg in figure (5−E12). Find the accelerations of m1, m2 and m3. The string from the upper pulley to m1 is 20 cm when the system is released from rest. How long will it take before m1 strikes the pulley? Suppose the block m1 moves upward with acceleration a1 and the blocks m2 and m3 have relative acceleration a2 due to the difference of weight between them. So, the actual acceleration of the blocks m1, m2 and m3 will be a1, (a1 − a2) and (a1 + a2), as shown. 19g29up, 17g29 down and 21g29down, respectively. In the previous problem, suppose m2 = 2.0 kg and m3 = 3.0 kg. What should be the mass m, so that it remains at rest? For m1 to be at rest, a1 = 0. Calculate the tension in the string shown in figure (5−E13). The pulley and the string are light and all the surfaces are frictionless. Take g = 10 m/s2. Consider the situation shown in figure (5−E14). Both the pulleys and the string are light and all the surfaces are frictionless. (a) Find the acceleration of the mass M; (b) find the tension in the string; (c) calculate the force exerted by the clamp on the pulley A in the figure. Let the acceleration of mass M be a. 2 Mg3at an angle of 45° with the horizontal. Find the acceleration of the block of mass M in the situation shown in figure (5−E15). All the surfaces are frictionless and the pulleys and the string are light. Let acceleration of the block of mass 2M be a. So, acceleration of the block of mass M will be 2a. Find the mass M of the hanging block in figure (5−E16) that will prevent the smaller block from slipping over the triangular block. All the surfaces are frictionless and the strings and the pulleys are light. Block ‘m’ will have the same acceleration as that of M’, as it does not slip over M‘. Find the acceleration of the blocks A and B in the three situations shown in figure (5−E17). Find the acceleration of the 500 g block in the figure (5−E18). A monkey of mass 15 kg is climbing a rope fixed to a ceiling. If it wishes to go up with an acceleration of 1 m/s2, how much force should it apply on the rope? If the rope is 5 m long and the monkey starts from rest, how much time will it take to reach the ceiling? The monkey should apply a force of 165 N to the rope. A monkey is climbing on a rope that goes over a smooth light pulley and supports a block of equal mass at the other end (figure 5−E19). Show that whatever force the monkey exerts on the rope, the monkey and the block move in the same direction with equal acceleration. If initially both were at rest, their separation will not change as time passes. Suppose the monkey accelerates upward with acceleration a and the block accelerates downward with acceleration a‘. Let force exerted by the monkey be F.
If acceleration −a‘ is in downward direction then the acceleration a‘ will be in upward direction. This implies that the block and the monkey move in the same direction with equal acceleration. 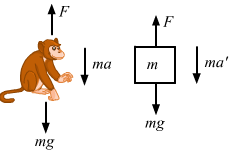 If initially they were at rest (no force is exerted by the monkey), then their separation will not change as time passes because both are moving same direction with equal acceleration. The monkey B, shown in the figure (5−E20), is holding on to the tail of monkey A that is climbing up a rope. The masses of monkeys A and B are 5 kg and 2 kg, respectively. If A can tolerate a tension of 30 N in its tail, what force should it apply on the rope in order to carry monkey B with it? Take g = 10 m/s2. Let the acceleration of monkey A upwards be a, so that a maximum tension of 30 N is produced in its tail. So, A can apply a maximum force of 105 N on the rope to carry monkey B with it. For minimum force, there is no acceleration of A and B. 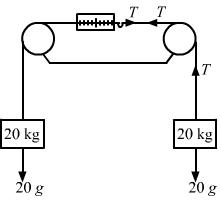 ∴ To carry monkey B with it, monkey A should apply a force of magnitude between 70 N and 105 N.
Figure (5−E21) shows a man of mass 60 kg standing on a light weighing machine kept in a box of mass 30 kg. The box is hanging from a pulley fixed to the ceiling by a light rope, the other end of which is held by the man himself. If the man manages to keep the box at rest, what is the weight recorded on the machine? What force should he exert on the rope to record his correct weight on the machine? Hence, the weight recorded on the machine is 15 kg. So, the man should exert a force of 1800 N on the rope to record his correct weight on the machine. A block A can slide on a frictionless incline of angle θ and length l, kept inside an elevator going up with uniform velocity v (figure 5−E22). Find the time taken by the block to slide down the length of the incline if it is released from the top of the incline. The force on the block which makes the body move down the plane is the component of its weight parallel to the inclined surface. A car is speeding up a horizontal road with acceleration a. Consider the following situations in the car: (i) A ball suspended from the ceiling by a string is maintaining a constant angle with the vertical. Find this angle. (ii) A block is kept on a smooth incline and does not slip on the incline. Find the angle of the incline with the horizontal. Let the pendulum (formed by the ball and the string) make angle θ with the vertical. (ii) Let the angle of the incline be θ. A block is kept on the floor of an elevator at rest. The elevator starts descending with an acceleration of 12 m/s2. Find the displacement of the block during the first 0.2 s after the start. Take g = 10 m/s2. s=ut+12at2 =0+1210×0.22=5×0.04 =0.2 m=20 cmThe displacement of the body is 20 cm during the first 0.2 s.